It’s a pleasure to meet Gary Smoot. 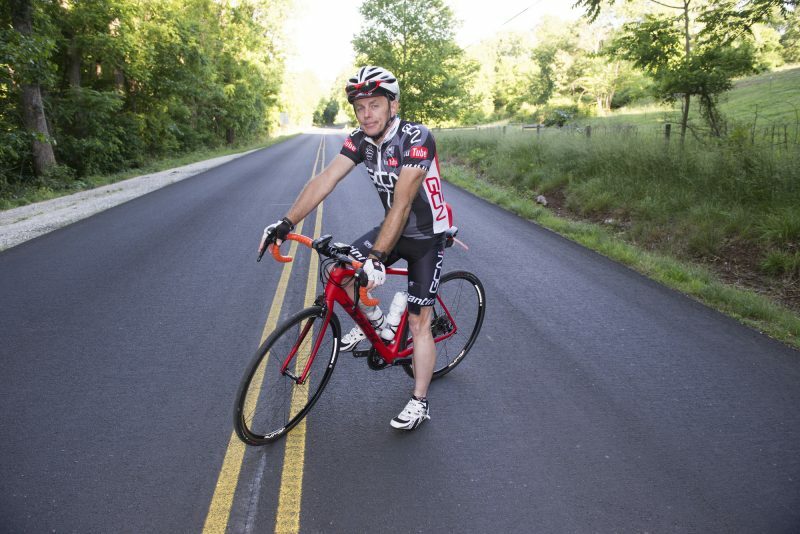 Gary Smoot pauses during a recent training ride in preparation for his 27th Bike MS ride. This weekend (June 3-4), Gary will bike 200 miles for other people he considers family — a longtime friend whose daughter recently lost her life to multiple sclerosis. He is one of hundreds of bikers riding in Bike MS, a series of cycling events that raise money for the National MS Society. The Colonial Crossroads Bike MS starts Saturday with a circuitous route from Richmond to Williamsburg, Virginia. The following day, the cyclists will pedal back to Richmond. This is Gary’s 27th year participating in Bike MS, which raises money to support MS research and other activities to improve lives of people with the disease. It’s one of several long distance cycling trips he has enjoyed over the years, but it may be the most meaningful. Gary joined the University of Lynchburg grounds crew about five years ago and has made many friends on campus in that time. This year, he has recruited Dr. Adam Dean, an avid cyclist and a history professor, to join him for Bike MS.
Gary has biked for much of his life, and he enjoys long rides for fun as well as for a good cause. Last week, he pedaled 140 miles round-trip from his Lynchburg home to Wintergreen Resort in the mountains of Nelson County. Although he faced some powerful wind gusts on the nearly 12-hour ride, he looks back on it now with a smile.